This species is widely distributed along the entire Mississippi drainage from western New York to eastern Kansas, Nebraska, and South Dakota, south to Texas and Louisiana and Tombigbee River in Alabama. In Canada, it occurs in the Lake Huron, Lake St. Clair, and Lake Erie drainage basins of Ontario, and in the Red River-Nelson River system of Manitoba. It is generally considered stable throughout most of its range. Comments: The Wabash pigtoe has no external bumps, waves or rays to help identify it. Its shape can vary from being nearly round to very elongate. The external color is reddish or yellowish-brown, becoming darker with age. Darker growth-rest lines (rings) are often obvious. Inside, the nacre is white, salmon or rose pink. It is often mistaken for the round pigtoe. The orange foot color is a helpful identifying characteristic, contrasting with the tan to whitish foot of the round pigtoe. The Wabash pigtoe is found in rivers and large creeks of eastern Kansas. 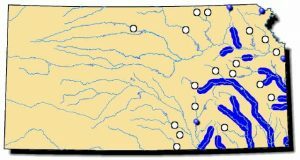 Its past distribution was farther north and west where relic shells can still be located in the Ninnescah, Chikaskia, Republican and South Fork Big Nemaha rivers. 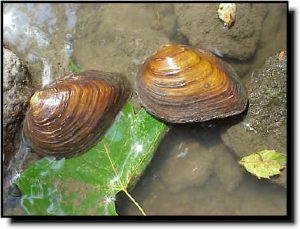 A closely related mussel, the Ozark pigtoe, is very similar to the Wabash pigtoe but is smaller, more flattened and of uniform shell thickness. It may occur in the Spring River of Cherokee County.